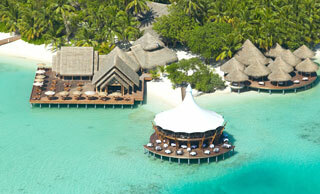 30 Water Villas – (92 sq.m); Set on stilts over the lagoon and offering spectacular panoramic sea views. 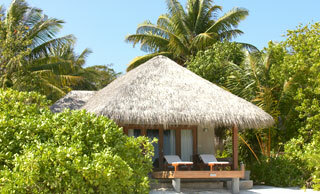 The Water Villas are built entirely of wood and feature coconut-thatch roofs. Spacious over water deck allows you to lounge in total privacy. Wooden stairs from the deck step directly into the crystal clear water allowing you to swim or snorkel straight from your villa. Villa Amenities: • Individually controlled air conditioning • Ceiling fan for natural ventilation • Four poster bed • Bathtub overlooking the sea • Indoor shower • Hot and cold fresh water • Luxury bathroom amenities • Bathrobes and slippers • Hairdryer • Private in-villa bar • Wine chiller • IDD telephone • Wireless and cable internet access • In-villa safe • Satellite TV • DVD/CD player • Espresso machine. garden. Villa Amenities: • Individually controlled air conditioning • Ceiling fan for natural ventilation • King size bed • Private garden bathroom with bathtub and shower • Indoor shower • Hot and cold fresh water • Bathrobes and slippers • Hairdryer • Private in-villa bar • IDD telephone • Wireless and cable internet access • In-villa safe • Satellite TV • CD stereo system • In-villa coffee and tea making facilities. Lighthouse Restaurant; An unparalleled stylish dining experience which encompasses an eclectic modern cuisine with Asian and Mediterranean influences. This amazing multi-tiered over water restaurant features an extensive wine cellar. Cayenne Grill; Adjacent to the lagoon, casual al fresco dining. Offering a wide selection of grilled seafood, meats and vegetarian options with fresh, light salads and accompaniments. This dining experience is complemented with a select range of wines. Lime Restaurant; Interesting culinary and dining experiences in an elegant but informal setting. 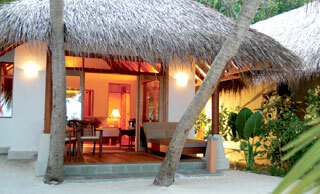 Situated on the edge of the lagoon. 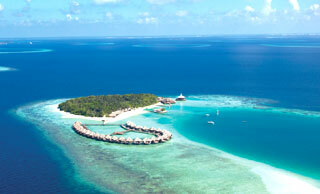 exquisite views of the horizon add to the diverse all day dining journeys which is on offer. Villa Dining; Personalised service in the privacy of your villa. Available 24 hours a day. Out-Villa Dining; Exclusive and intimate experiences are tailored to your requirement to complement any occasion. Lighthouse Lounge: Stylish lounge bar with panoramic views. Offers a selection of tropical Martini Cocktails, Whiskies and Cognacs. Perfect place to indulge in glass of fine champagne. Sails Bar; An evening gathering point offering a wide selection of freshly squeezed tropical juices, cocktails, wines and beers.